The purpose of the study was to determine velocity changes in relation to the load lifted along with their muscular activity. Twenty athletes representing different sport disciplines, familiar with the flat bench press took part in the research project. The ANOVA analysis revealed a significantly higher effect on range of mean velocity (F = 128.34; η2 = 1.22 with p = 0.001) and maximal velocity (F = 7 3.31; η 2 = 0 .81 w ith p = 0 .001) t o m easured l oads ( 70÷100% 1-RM) i n a scending p hase. Tukey’s p ost-hoc t ests revealed a statistically significant difference between 70% and 100% 1-RM loads, in mean velocity with p = 0.001 and maximal velocity with p = 0.001. Similarly the results revealed a statistically significant difference between 80% and 100% 1-RM loads in mean velocity (p = 0,012) and maximal velocity (p = 0,021) during the ascending phase. Relationship between velocity and the muscles activity indicates that the anterior deltoid and latissimus dorsi muscles show synergy and a significant relationship for loads 90 and 100% 1-RM. The triceps brachii muscle shows a higher relationship with velocity of the barbell for loads 70% and 80%, then the relationship of the pectoralis major muscle with velocity only for 90% 1-RM. 1. Barnett C., Kippers V., Turner P. Effects of Variations of the Bench Press Exercise on the EMG Activity of Five Shoulder Muscles. Journal of Strength and Conditioning Research. 1995; 9 (4): 222–227. 2. Cohen J. Statistical power analysis for the behavioral sciences (2nd ed.). 1988; Hillsdale, NJ; Erlbaum. 3. Duffey M.J., Challis J.H. Fatique effects on bar kinematics during the bench press exercise. J. Hum. Kinet. 2007; 21: 33–40. 4. Elliott B.C., Wilson G.J., Kerr G.K. A biomechanical analysis of the sticking region in the bench press. Med. Sci. Sports Exerc. 1989; 21: 450–462. 5. Hermens H.J., Freriks B., Disselhorst-Klug C., Rau G. Development of recommendations for SEMG sensors and sensor placement procedures. J Elect Kin. 2000; 10 (5): 361–374. 6. Konrad P. The ABC of EMG: A practical introduction to kinesiological electromyography. Version 1.0. Noraxon INC., USA, 2005; 29–33. 7. Król H., Golas A., Sobota G. Complex analysis of movement in evaluation of flat bench press performance. Acta of Bioengineering and Biomechanics. 2010; 12 (2): 93–97. 8. Lander J.E., Bates B.T., Swahill J.A., Hamill J. A comparison between free-weight and isokinetic bench pressing. Med Sci Sports Exerc. 1985; 17 (3): 344–353. 9. Lehman G.J., MaCmillan B., Macintyre I., Chivers M., Fluter M. Shoulder muscle EMG activity during push up variations on and off a Swiss ball. Dynamic Medicine. 2006; 5: 7. 10. Madsen N., McLaughlin T. Kinematic factors influencing performance and injury risk in the bench press exercise. Med Sci Sports Exerc. 1984; 16 (4): 376–381. 11. Maszczyk A., Roczniok R., Czuba M., Zając A., Waśkiewicz Z., Mikolajec K., Stanula A. Application of regression and neural models to predict competitive swimming performance. Perceptual &amp;amp; Motor Skills. 2012; 114 (2): 610–624. 12. Maszczyk A., Zając A., Ryguła I. A Neural Network model approach to athlete selection. Sport Engineering. 2011; 13: 83–93. 13. Pearson S.N., Cronin J.B., Hume P.A., Slyfield D. Kinematics and kinetics of the bench – press and bench – pull exercises in a strength – trained sporting population. Sport Biom. 2009; 8: 245–254. 14. 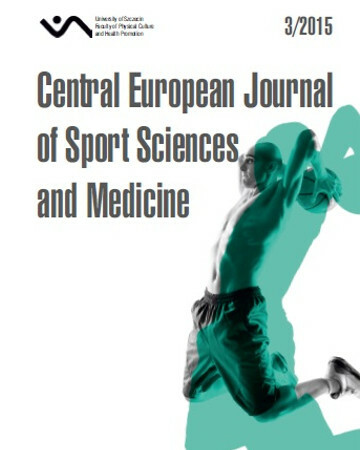 Requena B., Zabala M., Ribas J., Ereline J., Paasuke M., Gonzalez-Badillo J.J. Effect of post-tetanic potentiation of pectoralis and triceps muscles on bench press performance. Journal of Strength and Conditioning Research. 2005; 19 (3): 622–627. 15. Reynolds J.M., Gordon T.J., Robergs R.A. Predictions of one repetition maximum strength from multiple repetition maximum testing and anthropometry. Journal of Strength and Conditioning Research. 2006; 20 (3): 584–592. 16. Saeterbakken A., van den Tillaar R., Fimland M. A comparison of muscle activity and 1-RM strength of three chest-press exercises with different stability requirements. J Sports Sci. 2011; 29 (1): 1–6. 17. Sakamoto A., Sinclair P.J. Effect of movement Velocity on the relationship between training load and the numer of repetitions of bench press. J. Strength Cond. Res. 2006; 20 (3): 523–527. 18. Santana J.C., Vera-Garcia F.J., Mcgill S.M. A kinetic and electromyographic comparison of the standing cable press and bench press. Journal of Strength and Conditioning Research. 2007; 21 (4): 1271–1279. 20. Van Den Tillaar R., Ettema G. A comparison of successful and un successful attempts in maximal bench pressing. Medicine and Science in Sports and Exercise. 2009; 41 (11): 2056–2063. 21. Walshe A.D., Wilson G.J., Ettema G. Stretch shorten cycle as compared to isometric preload: contributions to enhanced muscular performance. J Appl Physiol. 1998; 84: 97–106. 22. Welsch E.A., Bird M., Mayhew J.L. Electromyographic activity of the pectoralis major and anterior deltoid muscles during three upperbody lifts. J. Strength Cond. Res. 2005; 19: 449–452.